The under 300 MB patch is available now. DICE’s Star Wars: Battlefront has received its first major content update (for those who pre-ordered the game at least) with the Battle of Jakku. Along with two new maps and the 40 player Turning Point mode, DICE also released a new patch for the shooter. 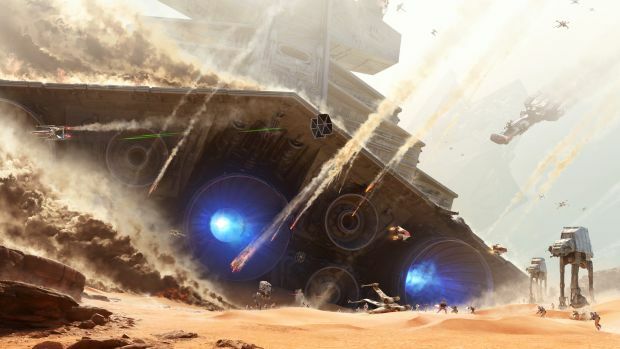 Patch 1.03 adds supports for Battle of Jakku but also comes with a ton of other fixes. These include optimizations for audio, adjustments to the HUD, balancing tweaks for the different game modes, improvements for online traffic performance, crash and stability fixes, fixes for vehicles and physics improvements and more. The patch is under 300 MB to download overall. The Battle of Jakku is a free update and will be available to all players on December 8th on PS4, Xbox One and PC. If you’ve already gotten your hands on it, what are your thoughts on the new maps and Turning Point? Let us know in the comments below.